If you’ve ever wondered how the tracks on Life’s An Adventures’ Three Capes Walk are so well maintained you’ve got a whole army of volunteers to thank. Like those from the Hobart Walking Club (established in 1929) who for decades have been spending their weekends and free week days clearing tracks from vegetation, fallen trees and other debris. Yes, the good rangers at National Parks do a lot of work but if it wasn’t for the blood, sweat and tears of many a volunteer a lot less would be done. 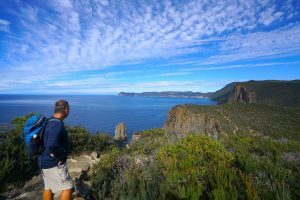 If fact it was the Hobart Walking Club that first created bushwalking tracks in the Tasman Peninsula long before there was an official Three Capes Track walk. Prior to any tracks, the area was seldom walked due to patches of dense wiry scrub or extensive thick forest, and the scarcity of running water. Life’s An Adventure spoke to Andrew Davey, President of Bushwalking Tasmania. LAA: How long has the Hobart Walking Club been involved in track clearance and maintenance in the Tasman Peninsula? The HWC has been involved from the beginning with regards to a coastal walking track on the Peninsula. It conceived it, and got official permission for such in 1972 from the several Authorities involved (eg Forestry, Parks and Council). This after some track marking and cutting since at least 1967, when some stunning scenery was discovered; little of the tracks were suited to the general public. Frank Morley was a great mover of the project initially. A few years back records indicated the Club had put in over 8,000 man-days of work in the Peninsula area since work officially started. More than that would have been put in elsewhere, mainly greater SE Tas. Nowadays Parks looks after the main Three Capes Track. We look after the ancillary tracks we / local walkers use. What’s their relationship with Parks Tas? The relationship with Parks has mostly been good, but went through a down period when some in Parks were too ‘wilderness’ oriented. This changed with a change of Government and some petitions I did (as chair of the State’s bushwalking body) to the then Government and the Head of Parks. It did take me three years to get the permission, and a while to get us back into general trackwork due to the many refusals by PWS (Parks) at that time – the result (the permission) is an agreement called: “Work As You Walk”, restricted to hand tools. A few years later I was able to get a separate agreement with respect to chainsaw use; this required follow-up for particular Clubs and tracks. Initially this power tool work was always under direct Parks supervision. Now this not necessary on some cases now as it was realised we are not ‘gung ho’ with chainsaws. Use of power tools involves paying for and getting licences or chainsaw use and first aid. Signs and safety items are also required. Travel is another cost. The Hobart Walking Club now has a general permission to work on tracks with hands tools, plus permission to be able to use power tools on 11 tracks (around Southern Tasmania) without having to seek permission when we wish to work. We can liaise to get permission to work on extra tracks as individual ‘projects’, usually for a limited interval. Lately we have received wants for more work from Rangers in Parks than we can practicably cope with or fund. LAA: How has the popularity of the Thee Capes Track affected the maintenance work required in the area? Due to the decreased camping (several campsite closures), most walks that are not the ‘commercial’ Three Capes Track have increased use by only a little, some have decreased use. It is mainly the Cape Pillar Track that gets some more use. The rougher tracks may have had some minor increase, but not to the extent extra work is required. As for man-hours a year lately, it can only be a guess in terms of man-days. There is a lot not counted under Work As You Walk. A wild estimate would be 500 or more man-days; a day being about 6-8.5 hours depending on travel, the weather and the goal. The HWC was involved in track marking and clearing long before it did so on the Tasman Peninsula, from its beginning and several huts have been built by the Club. So the next time you’re bushwalking in the Tasman Peninsula spare a thought for the good men and women of the Hobart Bushwalkers who have made your wonderful wilderness experience possible!